Renowned British artist Monster Chetwynd today unveils a pair of spectacular giant leopard slugs outside Tate Britain, each measuring over 10 metres long. 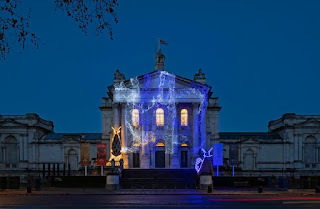 These huge sculptures made of compostable materials are illuminated by LED rope lighting and accompanied by swathes of blue and white LED slug trails across the façade of the building. 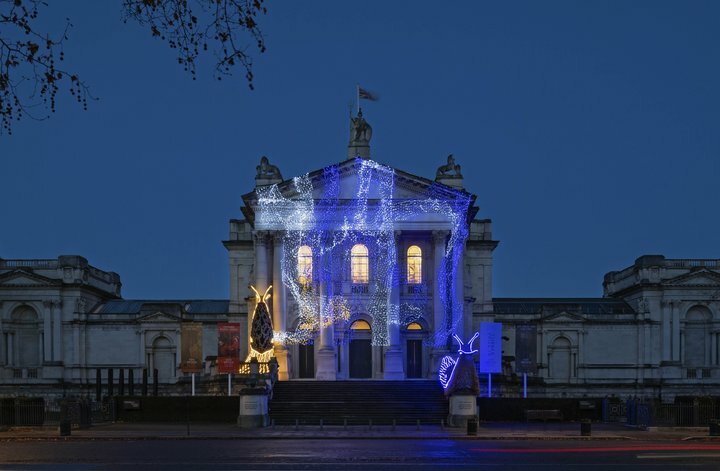 In place from 30 November 2018 to 25 February 2019, the work is the latest in Tate Britain’s series of annual commissions to mark the winter season, following last year’s installation of festive lights by Alan Kane. Lighting up the gallery at the darkest time of year, Chetwynd’s work reflects her interest in alternative energy sources and the idea that we may one day use bioluminescence to light city streets. The artist also took inspiration from a David Attenborough nature documentary, Life in the Undergrowth, which revealed the mating rituals of leopard slugs. In order to reproduce, these slugs slither up a tree and dangle on a glittering thread of slime, typically in darkness, entwining tube-like growths from their heads which glow blue as they mate. The trails of LED lights are also reminiscent of other bioluminescent animal life, such as plankton in the ocean, as well as stars and galaxies in the winter sky. Through these otherworldly slugs and their hypnotic mating rituals, Chetwynd reminds us that the darkness of winter can be a time of renewal and rebirth. As light fades, many animals slow down and take shelter, often fattening up and hibernating, knowing that life and light will be restored after the darkness. Ancient civilisations built structures to align with the sun on solstice days and celebrated deities concerned with birth and renewal at this time of year, while Christians hail the birth of Jesus just a few days after the December solstice. Chetwynd’s slugs may appear irreverent and somewhat perplexing, but the artist uses them to raise serious ecological concerns as well as to show that even supposedly repulsive creatures can be transformed into something wonderous. This year’s commission will be celebrated with host of festive activities at Tate Britain. On 15th December, the gallery will host a free Winter Fair featuring a pop-up market, performances from English National Opera and drop in tours, talks and workshops. The Tate Britain Winter Commission: Monster Chetwynd has been curated by Aïcha Mehrez, Assistant Curator of Contemporary British Art at Tate Britain.